That puts Maine’s largest daily newspapers under common ownership, with the exception of the Bangor Daily News, expanding Brower’s statewide news organization at a scale he said he did not envision in 2004, when he sold his direct-mail startup Target Marketing. He had founded and still owns the Rockland-based Free Press in 1985. Brower said those synergies include new options for the commercial presses that have operated as competitors. As competitors, Brower said his Alliance Press in Brunswick might take a job that’s not ideal — either because of its equipment or staff timing or any host of other reasons — in order to keep a client. Combined, he said, the company can buy paper more cheaply and send that work where it’s most efficient. “[The presses] have different strengths,” Brower said. The combined company will have almost 800 employees, Brower estimates, with 225 at Sun Media, about 400 at MaineToday Media and 150 at the midcoast Courier Publications. Brower said in a telephone interview that the 225 employees of Sun Media will get offers to continue in their current jobs at their current pay. Formally, Sun Media Group will transfer its assets to SJ Acquisition, a company controlled by Brower’s RFB Holdings. The deal is set to close Aug. 1. That will transfer ownership of Sun Media’s printing division and 17 publications, including the Sun Journal and weeklies operated under The Forecaster and Current Publications brands. It also owns a chain of weekly papers in western Maine and Maine Women Magazine, 95 North and My Gen magazines. Four generations of the Costello family have owned and managed the paper. The sale comes almost exactly two years after the death of James Costello Sr., the Sun Media Group’s longtime president and publisher. Staff throughout the Sun Media Group were informed of the sale in a companywide meeting in the Sun Journal newsroom around 2 p.m., attended by members of the Costello family, Reade Brower, MaineToday Media president and CEO Lisa DeSisto and Chris Miles, CEO of Alliance Press, according to Judy Meyer, the Sun Journal’s executive editor. During the meeting, Maureen Costello Wedge, the group’s vice president for human resources, was audibly holding back tears, according to an employee who was granted anonymity because they were not authorized to speak for the company. David Costello was at the offices of The Forecaster weekly papers to announce the sale in person to that staff. Steve Costello said in a telephone interview that Wedge will be staying on at the company to help with the transition and his brother Jim will continue to oversee the printing division. He, his other siblings and brother-in-law and company treasurer Ed Snook will leave the company, he said. MaineToday Media’s president and CEO Lisa DeSisto will also serve as CEO of Sun Media Group. During the call, Brower told staff to judge him based on his actions when he purchased MaineToday Media in 2015. 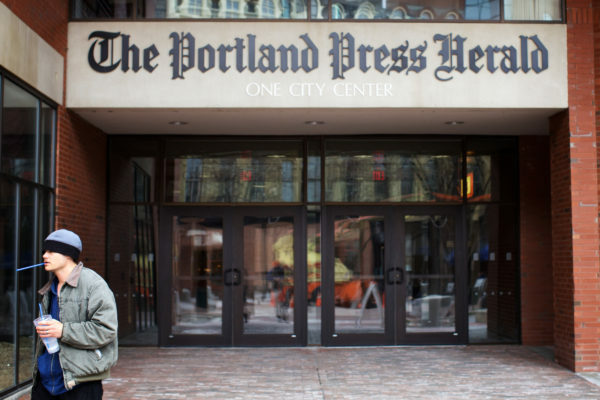 In a telephone interview, Brower said MaineToday kept on nearly all of its staff and he expects the company will be profitable this year, after upgrades to its South Portland printing press and a cost-cutting move from “high-rent” offices in downtown Portland to its own building in South Portland. But the case with Sun Media is different, he said, and won’t require major changes to become sustainable. “It’s not a paper that we’re buying to fix,” Brower said. Costello and Brower said Sun Media was not shopping around for a buyer but saw the opportunity after years of working together on projects, including a printing contract with the Bangor Daily News, which shut down its Hampden printing plant in 2013. Jennifer Holmes, vice president of Bangor Publishing, said her company signed a 10-year printing deal with Sun Media in 2013, expiring in 2023. Costello said the sale includes that contract and other printing deals. Through MaineToday, Brower owns the Press Herald, Maine Sunday Telegram, Kennebec Journal, Morning Sentinel and the Coastal Journal. His group also owns Courier Publications, which includes the Rockland Gazette, Camden Herald and the Belfast Republican, as well as the Rutland Herald and Barre-Montpelier Argus in Vermont. Some of those deals, like those in Vermont, Brower said were motivated by a desire to keep the newspapers operating. Bangor Daily News writer Jake Bleiberg contributed to this report.